PanARMENIAN.Net - The Republican Party of Armenia has confirmed that former Prime Minister Karen Karapetyan is no longer a party member. 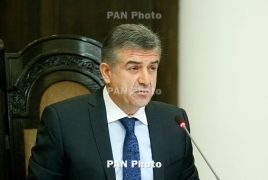 According to RPA representative Ruben Tadevosyan, Karapetyan submitted a corresponding letter on December 14. In spring 2018, when Karapetyan was the First Deputy PM and ex-President Serzh Sargsyan had just been sworn in as the new Premier, tens of thousands of Armenians took to the streets across the country to protest against the ruling authorities. As a result, opposition leader Nikol Pashinyan became the country’s new Prime Minister, while party secured a landslide victory in the snap parliamentary elections on December 9.